Fruitless Pursuits: National Theatre Live - Coriolanus Review! 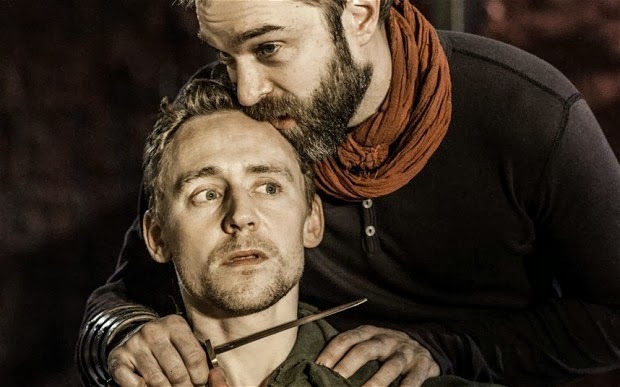 In late February a few of the Fruitless Pursuits team caught NT Live and the Donmar Warehouse's live broadcast of Coriolanus starring the likes of Tom Hiddleston and Mark Gatiss. It was fantastic! Follow me under the cut for a review. 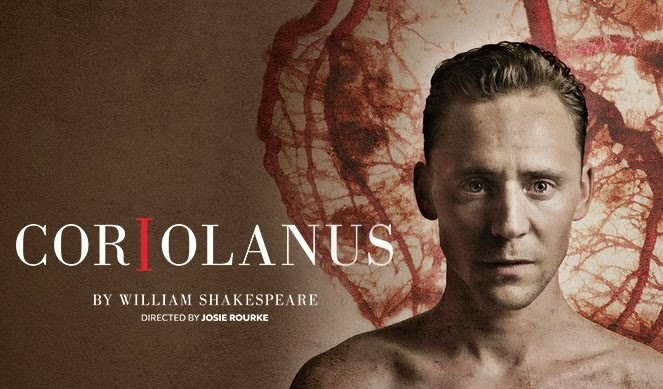 Coriolanus is one of Shakespeare's less celebrated tragedies and prior to seeing this production I hadn't read it. I'm actually very glad that I hadn't because I had no expectations at all going in, I didn't know the story and the less grand scale in this production didn't bother me in the slightest. Coriolanus is the story of a great Roman General, Caius Marcius, his rise to fame and to power and his headlong rush into his own destruction. While Marcius understands war strategy and fights long and hard for Rome, he thinks very poorly of the people that the city itself represents and protects. His unbridled malice leads to the people and politician's alike revolting against him and casting him away. I found myself thinking about this play so much afterwards that I went to the screening again the following day and it held up well on second viewing, perhaps even better than the first as you pick up more of the nuance's of the character development and plot. Surprisingly, this performance had a lot of humour included. Sprinkled in between the fighting and the long enraged rants of Coriolanus were some belly laughing moments - especially funny when seeing that even a prized warrior cowers when being scolded by his mother. Speaking of whom, Coriolanus' mother Volumnia was intriguing and fantastically performed by Deborah Findlay. She brought a lot of both the old wise viper and the soft caring woman to the role, which worked spectacularly well towards the end. Mark Gatiss as Menenius was mesmerising. His ability to completely inhabit every character he undertakes makes him a delight to watch. Excruciatingly witty and at times vulnerable, Menenius brought a lot of heart and warmth at times to a play where the audience really doesn't know who they would side with, if anyone at all. That's perhaps the thing I loved most about Coriolanus. That siding with a man who believes that there is a class born to rule and looks down on those he protects is highly unlikely, but seeing that man falter and fail is also unsettling. Siding with the people should seem natural; yet even they treat those that protect them so poorly that the audience struggles to truly feel sorry for them. Tom Hiddleston's performance as Coriolanus was intense. He really showed a different set of acting skills in inhabiting a man that seems, for all intents and purposes, to be as far from his own personal ideological self as possible. The malice with which he addresses the people is terrifying, while one cannot help but admire the strength and bravery shown in his combat. The suffering he endures for Rome is heartfelt at times and at others one truly believes that he does this only for himself and his own glory and that it only makes him vain rather than a champion. The small space meant that the scale of this production was not comparable to others, or so some people commented. Honestly, I think that made it more exciting in a different way. There is nothing that can cover for the actors in that kind of small and under-dramatic space. Nothing to hide the tears, snot and facial expressions and under that level of scrutiny the ensemble excelled. They moved the audience with confidence and with gusto in delivery. They moved them to tears at times and laughter at others. I was really impressed that something as old as Shakespeare in such a small space and taking away any grand element, was still so relevant and riveting in this day and age. The intermission interview with Director Josie Rourke was delightful and the pre-performance making-of documentary was very interesting. Highly recommend catching this if it is screened again!